It was about 20,000 years ago that man first set eyes on the Franklin River - archaeological evidence shows that aboriginal people occupied caves in the grassy plains of the lower Franklin. Since then, much has changed - primarily the climate, which has resulted in the grasslands being replaced by cold temperate rain forest. The river became wild and remote, unchanged until the newly arrived Europeans pushed into the region in the early 1800s, driven by the desire to exploit. Firstly, it was the Huon pine and the possibility of mineral resources, and more recently it was the river itself, as a source for hydro-electricity. Unlike other areas of Tasmania, now transformed beyond recognition, the Franklin held no mineral wealth. The piners are long gone and, thanks to the power of the people, the river was not dammed and drowned for hydro power. 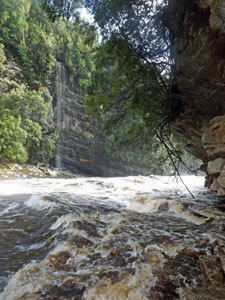 It remains one of Australia's last wild rivers, with barely a trace of human presence from its source to its end. The first descent of the river was only made in 1959, after two previous attempts. With modern equipment though, what once took several weeks, can now be rafted in a comfortable eight days (unless you are a crazy kayaker wanting to do the 110 km length in under 24 hours). 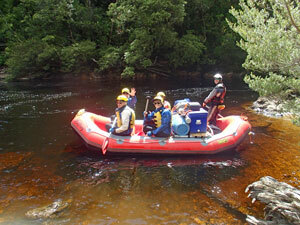 The river has become the domain of the adventurer and those seeking to experience the Tasmanian wilderness. To descend the Franklin, though, is not a journey for the foolhardy or ill-prepared - the white-water sections range from rippling grade 1 gravel races to thunderous grade 6 rapids with unpassable drops that need to be portaged. Over the years, nine people have lost their lives in these rapids, though these have been solitary kayakers taking unnecessary risks. The best way for the "average" adventurer to descend the Franklin is by raft, and there are now several commercial rafting companies that offer such trips - all having an impeccable safety record. We chose Franklin River Rafting, a company with 11 years experience taking people on Franklin River expeditions led by guides with 70 plus trips under their belts. With that experience, you get to know the river in all its moods and the different behaviours of rapids at different river levels, and that sort of knowledge inspires confidence. It proved to be an excellent choice. The fair Nello and I had assembled a group of eight congenial adventurers with whom to share this trip. This meant we could set our own departure date rather than join a mixed group leaving on one of the fixed departures. Thus we set out and flew down to Hobart to meet up with the others who had made their own ways to the Tasmanian capital. The day before departure, we met up with Ron and Vicki, Paul, Dave, Darlo and Don for our pre-trip briefing. 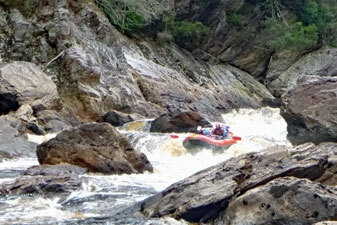 We had the good fortune to have Elias and Franzi, the owners of Franklin River Rafting, as our guides. Elias met us at a local outdoors store to run through the details of the trip and the safety precautions, hand out our wet-suits, thermals, waterproof tops, flotation vests and helmets plus heavy-duty drybags for personal items, and ensure that we were all carrying what was needed for the trip. His mantra was "keep warm and wet on the water, warm and dry in camp, and you will enjoy the rafting under any weather conditions". Early next morning, Elias, Franzi and the Franklin Rafting mini-bus pulled up at our hotel door. We loaded up our full dry-bags to join the assorted water-tight drums of food and supplies, eskies, paddles and, of course, the rolled up rafts, and climbed aboard. Once all our merry band were on the bus, we headed off down the Lyell Highway for the 4-hour trip across the middle of Tasmania to a short concrete bridge over the Collingwood River. 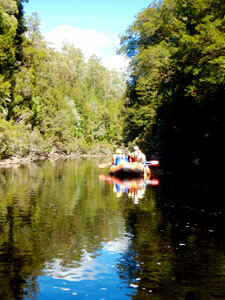 We had arrived at the starting point for our Franklin River expedition and my sense of anticipation was running high.